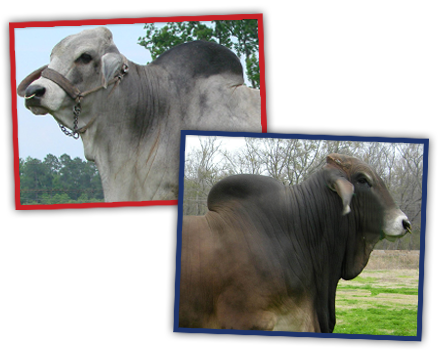 Louisiana Brahman Association (LBA) is one of the oldest state affiliates of the American Brahman Breeders Association. LBA members are a group of cattle breeders dedicated to the promotion of the Brahman breed. The bayou state of Louisiana has a long and rich Brahman history. A state known for an environment of tropical heat, humidity and insect infestations, Brahman genetics have been a necessity for the survival of a profitable cattle industry. These genetics were brought to Louisiana in 1854 with the Barrow importation of cattle from India. Richard Barrow of St. Francisville, Louisiana received two bulls from the Government of Great Britain, for his services in teaching cotton and sugar cane production to British officials. The “Barrow Grade” cattle soon populated much of the flatlands of the Gulf Coastal Plain from Mississippi to south Texas. Our association is open to any cattle producer in the state of Louisiana who is interested in American Grey or Red Brahman Cattle. LBA also has a junior association for young people who are interested in promoting the American Brahman breed. join our organization, in the bayou state of Louisiana, and get involved with the first beef breed developed in the United States, American Brahman. ***Food and Door Prizes*** Please make plans to attend! LBA Board Meeting at 6:30 pm. — Sponsors for Jambalaya Show are now being accepted. For $100 you can have a farm/ranch banner (provided by sponsor and no bigger than 4'x6') hung in arena during show, name announced during show and also name in the program. You must give your banner to Clint Galiano on Friday, November 16th, no later than 5:00 p.m. Please include your sponsorship with your entry fees. For more information contact: Clint Galiano at 985-748-7053.